Mix everything together. Dough may seem dry at first and very crumbly. This is where you shouldn’t be afraid to get your hands dirty and knead it by hand until it all holds together. Once done, wrap it in a foil let it chill in fridge for at least 30 min. Roll the dough on a floured surface into 3-4 mm thickness. You may notice for dough to crack while rolling it out but that’s normal. Cut out your shapes in pairs, where one will be solid and the other with a cutout of shapes that you may have. Bake it at 180 degrees for about 7 minutes. Let the cookies cool before moving off the baking sheet to prevent them from crumbling. 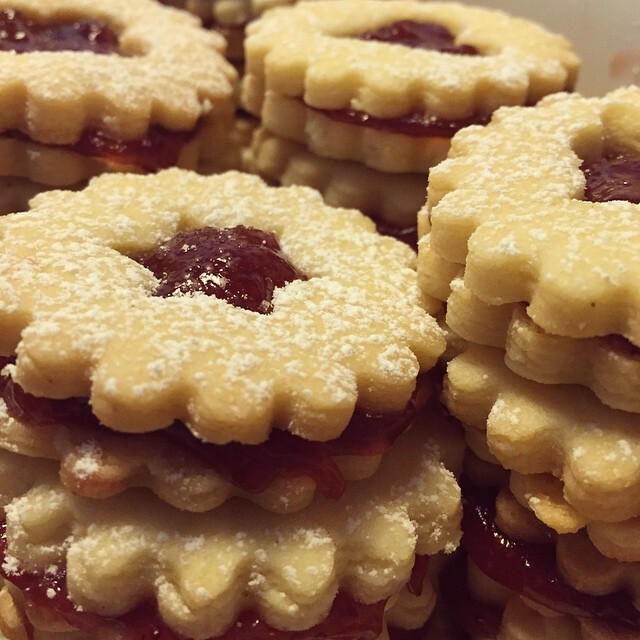 Bind your cookies with your favorite jam or nutella. You can also add some coco powder into your dough to make chocolate-based cookies, or instead of lemon use orange zest. If you don't Linzer cookie cutters, you can also bind the two solid shapes together and either cover the entire cookie with chocolate, or just half of them.